Our boys, Wilder and Brooks (4 and 22 months) are little rascals. They are curious, loud, bold, adventurous, and a wee bit wild. But best of all, they have the most amazing ability to turn just about anything into a good time. In fact, that's one of my favorite things about being a mama, watching these two turn the most mundane, dirty, or boring of activities into something exciting. They can make messes out of chores and fun out of work, and I am certain it will serve them well in life. Thankfully, our boys have this same attitude about their baby sister. Whether it's diapering, feeding, or putting Daphne down for a nap, they want to help and have fun doing it. I can't even get Daphne's diaper off quick enough before Brooks has the wipes out and Wilder is comforting her tears away. And when I ask Wilder to throw away the dirty diaper, he makes us all laugh by plugging his nose, holding his breath, and grinning all the way to the trash can. Earlier this month, when the kids and I stopped by the Porch House and Daphne overheated, the boys were eager to help. August is the heat of the summer around here and temperatures hit 104 degrees that day. With the AC yet to be installed and Daphne's skin flaming with a heat rash, we decided a quick bath was in order. 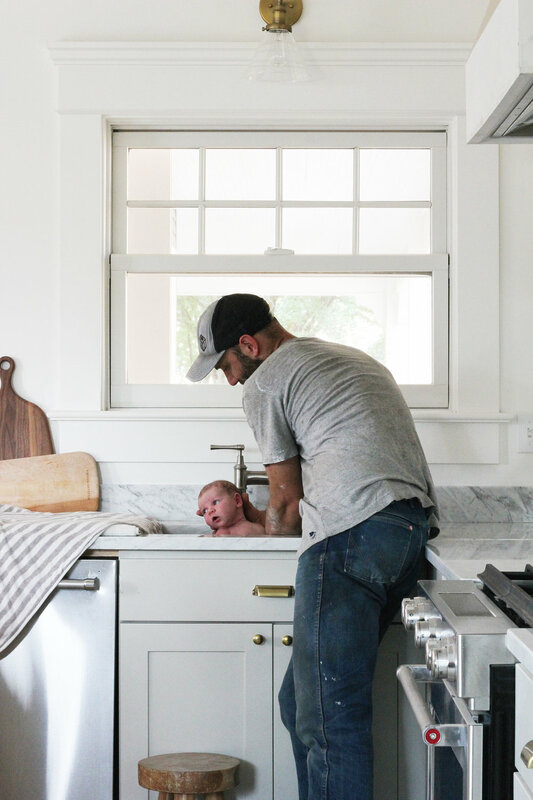 The Porch House has a super-deep, Elkay Crosstown stainless steel kitchen sink and Elkay Explore faucet which couldn't be better designed for a newborn bath. Honestly, I'd been dying to test them out since we installed these beauties back in April, and I wasn't about to miss our opportunity before this house goes on the market. We were lucky enough to discover Elkay right about the time our HGTV pilot started filming. They offered us a sink and faucet for our kitchen renovation and after doing a little research, I happily picked these out. I can't tell you how pleased Garrett was with the strength and durability of Elkay's products (they are heaaavy and well made!) and I was thrilled with how effortlessly they fit in our historic/crafted/welcoming kitchen design. We went with an undermount sink and a faucet with a pull-down-nozzle sprayer for ease of use and I only wish we had gotten to install both of these in our own home ;) I'm really digging the look of the mixed metals (both brass and stainless steel rule in this kitchen) and am so happy with the style. I toyed with the idea of using an apron-front sink in here, but in the end, I wanted something a little more modern and utilitarian. Something a little unexpected and fresh. And I love how they turned out! No surprise here, but our little rascals turned that bath into a chaotic sprayer-fight/splash-contest of a good time within seconds. Daphne wasn't having much of it, so I took her out and let her brothers play for a bit. For the record, this is business as usual for our family. 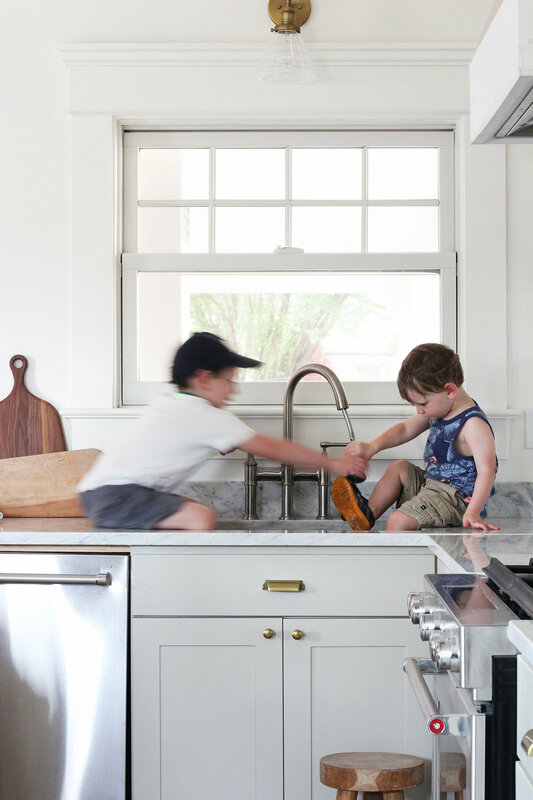 We let our kiddos play anywhere and everywhere at home (as long as it's not too messy), especially in the kitchen sink. Dinner dishes commonly turn into an hour long bubble-making and/or see-how-many-pots-fit-in-the-sink session. And it's almost a daily occurrence that we wash these kiddos' feet in our kitchen sink after they find, yet again, all the creatures there are to discover in our backyard pond. But that mess I prefer to the game that Wilder and Brooks like to play of seeing how many of mama's baking utensils they can pull out clean from the drawer, cover in soap and water, and put back away wet and soapy. Ha! rascals indeed. 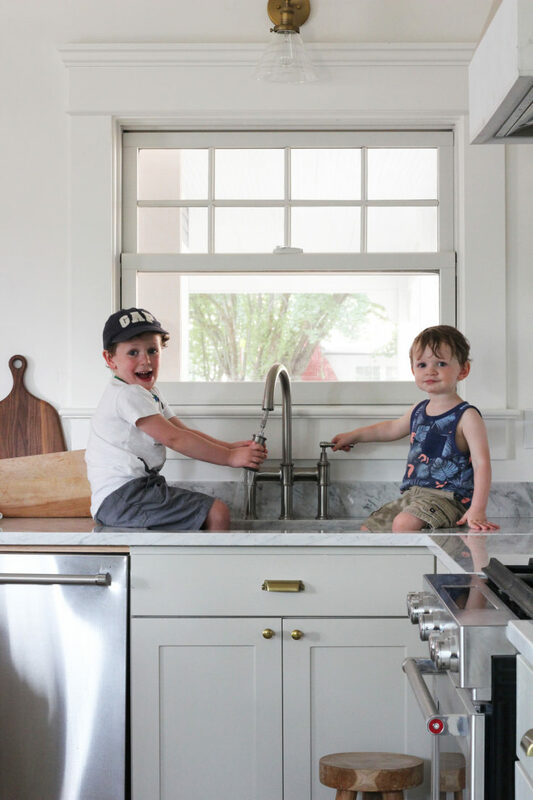 Pretty soon there will be three little rascals around our kitchen sink, making messes out of chores and fun out of work and my mama heart can hardly wait! 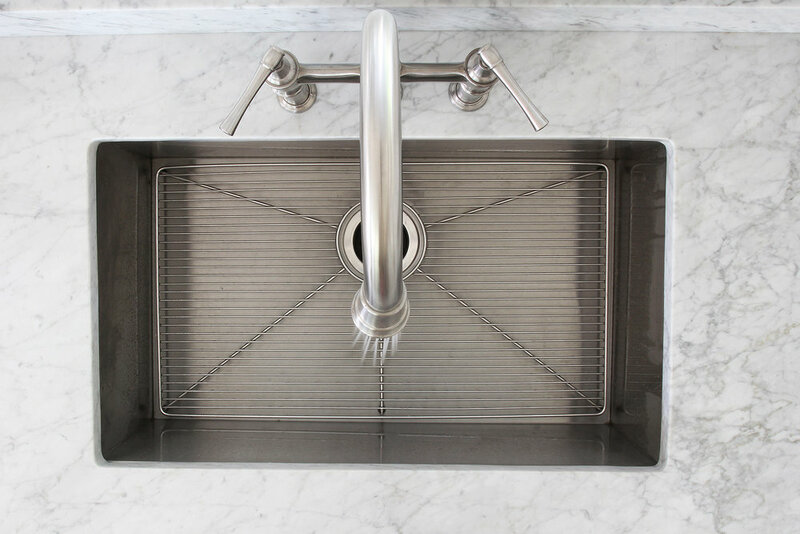 Thanks to Elkay for sponsoring this post and making really sturdy and beautiful sinks and faucets. And thanks to you for supporting the brands that support this blog.